Click the download button below to see what’s new. The TIA Portal V15 release is coming soon and will include full simulation capability for all devices! The Siemens Open Library was developed by DMC, Inc. over several years. Through a joint collaboration with Siemens Industry, DMC documented the library and released it as an Open Source Library open for anyone to use and distribute. The Library is Open Source and will allow for users to contribute content to help enhance the overall availability of functionality to the greater Siemens User Community. This library is targeted at S7-1200 and S7-1500 applications using a Siemens Comfort Panel, WinCC Advanced RT, or WinCC Professional. Special changes have been made to accommodate S7-300 and S7-400 processors, however these processors are no longer being actively developed for (final version is 2.1). The version of Portal used for initial development was V13 SP1, and the current version release is for V14 SP1. However, the project is activity supported by both the community and DMC – updates will continue to be released on a regular basis. Sign up here to receive an email when updates are released. Here is a short list of the supported and fully documented blocks contained in the library. Please consult the documentation for a full list and descriptions. Including brand new blocks such as Digital Output, Siwarex Load Cell Modules, Hydraulic Valve, Danfoss VFDs and more! The Siemens Open Library is an open source library, and contributions, improvements, and changes are welcome from anyone who has improved or added to the library. Please submit any custom objects or reports of issues to DMC by emailing them to [email protected]. Library objects may not be added immediately, but will be added as additional versions of the library are released. This is the last version of the library supporting S7-300/400 processors. Updated example project to have SiVarc functionality and added a HMI to the example project to show the auto-generation. Replaced WinCC Professional popup faceplates with screens which will use tag prefixed UDT fields for processing. Tag prefix will be assigned to the parent Screen Window that loads screen. Added Flow Totalizer control which combines an Analog Input with an Integrator to output the Integral value over a given time window. Branched GSeries VFD for 1500 and 1200 due to issues with low level command availability on the 1200. Added in the ‘Supplementary Blocks’ which are user submitted blocks. Copyright (c) 2018 DMC, Inc.
After you download the zipped folder you can extract it and find the Open Library VXX.zalXX file in the “2_Library” folder. When you open a project in TIA Portal you should go to the top navigation and select Options -> Global Libraries -> Retrieve Library…. Select the .zalXX file from the download and select a target directory. This will automatically open the Library in TIA Portal Global Libraries. Is there any sample projects with WinCC Advanced or Comfort so I can view the faceplates? The sample project as part of the download has an example of WinCC Comfort. Additionally the documentation goes over the faceplates. As I can see in Devices Function Blocks, all fcHMIbit calls have both bInToggle and bInLatch inputs to false, the result is the output bPLC is always FALSE. Is this correct? I am sorry for the delayed response, you should use fCHMIBit as either a Toggle, Latch, or one shot. If Toggle and Latch are both false it acts as a one shot. I put my email address in, and it tells me it is an invalid email??? You do not need your email address to download the library. Perhaps your email is formatted in a way we don’t expect. Can you send an email to the Contribute(at)OpenPLCLibrary.com and we can take a look? This was an issue that has been resolved. 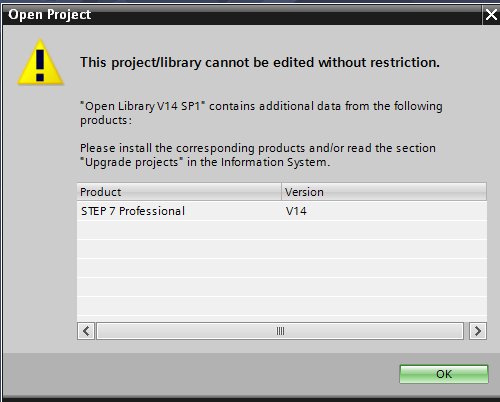 I try to open the Example Project V2.0 from TIA V15 but i get an error that optional package SiVarc is missing…. Ignore this error if you are not using SiVarc. Everything else still works. whitout wincc proffesional and withoud starter items. Are you unable to open the project? You should get some warnings, but the project should still open and you just wouldn’t be able to interact with the items you do not have a license for. Can the library be used with STEP 7 Basic? It should work with Basic but has not been tested yet. When I add the library to Step 7 TIA v14 Basic I get the warning that I am missing the prerequisite of Step 7 Professional. 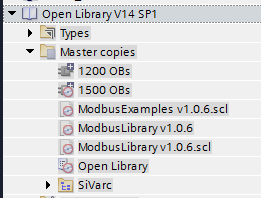 The library loads but none of the components can be added to the project. Can you show a screen shot with the Types Folder open and not just Master Copies? We are working with Siemens to get a Basic license to test. It might be related to SiVARC, so might be worth trying with V1.6, but we use Step 7 Professional for development, so I am unsure of the issues until we get a Basic license from Siemens. We are testing with Basic, can you send me an email [email protected]? We are unable to reproduce and need to gather some more information. Just tried again with v3.0. Still says that I need STEP 7 Professional and and the library items have a red circle on them and can’t be dragged into the project. The Siwarex module is not an official item in the library and a faceplate has not yet been developed. If you create one, please share it with us and we will include it in the library. Want to get notified of new releases via email? Emails will only be sent when new versions of the library are released.